Darling likes her comfortable home in England as a much loved family pet. When the British military drafts her into the war, Darling devises a sneaky plan to run away to return the children she loves. 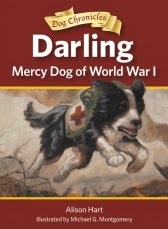 That is until she saves a wounded soldier and discovers her calling as a mercy dog. Upon completion of her military training, Darling saves the lives of countless soldiers and witnesses the horrors of war. She must learn to dodge bullets, dig in the trenches to find the wounded, and hardest of all, ignore the dead. The descriptions of battle introduce the young reader to the tragedies of war without being too gory. The focus on the narrative from a dog's point of view further the real point of courage and bravery as well as love and devotion. Anyone who has ever had a loyal dog as a best friend will have no trouble connecting to Darling and admiring her acts of heroism. A quick afterward on the history of dogs in World War I help the young reader further appreciate the loyalty of man's best friend. the publisher. Blog owner is not responsible for prize fulfillment. I think we would like that the dog is so loyal she tries to return to her family when separated. It would be nice to think that if our dog was taken away that he would try to get back home. It is also nice to think that our dog could be a hero and save lives. My son would like to think that his dog could do this. This looks like a really good book that even I would read. I think both my little ones would enjoy this because they love dogs! Thanks for the chance to win!